Crucifixus – Choir & Organ - An admirably courageous recording. Visits to the Capella Sistina are also made in Crucifixus, a collection of multi-part music for Holy Week sung by the Vasari Singers under Jeremy Backhouse. This ‘cream-cake’ compilation from the Billy Bunter school of programming will, no doubt, delight all their fans who want these popular Renaissance and Baroque works on one disc, and it is doubtful if any of the world’s leading amateur chamber choirs could do it better. It speaks volumes for the group’s dedication and commitment, but one can’t help feeling that Backhouse has done his singers a disservice be not resisting the temptation to stretch his forces too far. They sing with well-blended tone, wide dynamic range, and only occasional lapses of intonation. It’s all attractively done, if somewhat over directed at times, with rhetorically exaggerated dynamics making Gesualdo’s O vos omnes sound like a fifth sacred piece by Verdi! On the whole they are impressively secure in the more simply-scored repertoire which, and any choral singer can vouch, is not by any means easy to do well. It does them credit that the sustained sonorities of Palestrina’s Stabat Matar and Felice Anerio’s Christus factus est are so movingly captured, and they clearly appreciate the dissonance and tension in works by Gesualdo and Lotti. Where things become fragile are in the multi-voice works: Allegri’s Miserere, Caldara’s Crucifixus and the Stabat Matar of Domenico Scarlatti, which rely heavily on soloists. An admirably courageous recording. Crucifixus – American Record Guide - "...these performances display and extraordinarily high level of technical polish." This recording brings together classic works for Holy Week by Italian composers from the late 16th to the early 18th centuries. Some of the works, like the Palestrina Stabat Mater and Gregorio Allegri’s Miserere, are very well known. The program opens with the Palestrina and concludes with Domenico Scarlatti’s setting of the same text. I will confess that this is my first acquaintance with the Scarlatti Stabat Mater, an early work most likely written in Rome during his tenure as maestro di capella of the Basilica Giulia (1713-19). It is a more expansive setting than Palestrina’s, but then, who could ever top the deceptively simple eloquence of the concise masterpiece? Scarlatti’s setting is in ten parts with continuo. His expert counterpoint seems natural and spontaneous, at the service of the larger expressive purpose of the music. Every second work on the program is a motet on the text “Crucifixus etiam pro nobis” from the Nicene Creed. The three settings by Antonio Lotti (c. 1667-1740), in six, eight and ten parts, seem to explore the different facets of the anguished and impassioned expression suggested by the text. An impressive 16-part setting by Antonio Caldara (c. 1670-1736) precedes the concluding Scarlattis Stabat Mater. It seems that highly-accomplished English concert choirs are springing up faster than weeds. Jeremy Backhouse and the Vasari Singers are new to me, and the booklet gives no information about them other than photographs. The group photograph shows a mixed choir of 26 voices. I assume that they take their name form the 16th century art historian Giorgio Vasari. That together with the content of this disc suggests that they specialise in Italian renaissance and baroque repertory. Like so many English choirs their sound is smooth and well-blended. The basic tone is very warm, further enhanced by the acoustics of St. James’s Church, Clerkenwell Green, London. Backhouse’s interpretations are anything but dispassionate. Even in as understated a work as the Palestrina Stabat Mater, he introduces dramatic, almost romantic dynamic inflections that give the performance a vivid shape and propulsion. The singers demonstrate that they have plenty of power for the most stunning climaxes, but their tone never becomes wild or operatic. The Allegri Miserere seems to be performed from the corrupt but widely-accepted edition of Sir Ivor Atkins. The semi-chorus verses sound distant and somewhat compressed, apparently an attempt to give the impression of spatial separation. Apart from some untidy solo singing in the “Inflammatus” of Scarlatti’s Stabat Mater, these performances display and extraordinarily high level of technical polish. The music is magnificent and the program is effectively planned with the Allegri as the centerpiece, flanked by the shorter motets of Anerio and Gesualdo, the “Crucifixus” motets intervening and the Stabat Mater settings to open and close. Crucifixus – Cathedral Music - Altogether a most successful recording. Crucifixus – The Organ - The thick textures of Caldara’s à 16 use stile antico techniques in capturing a Baroque splendour similar to that of an El Greco painting. Crucifixus – Organists’ Review - Jeremy Backhouse produces a performance that is compelling in its sense of line, with the climaxes suitably expansive. 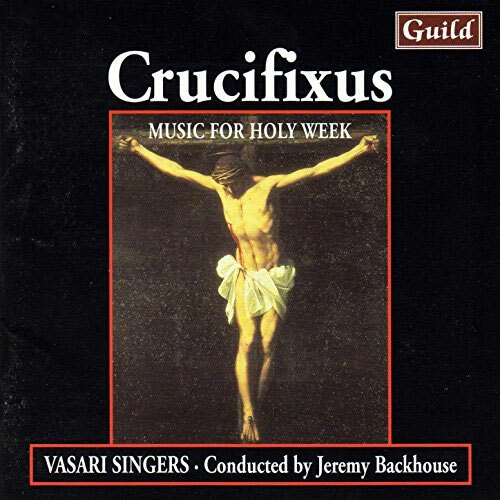 The work of a younger choir, Jeremy Backhouse’s Vasari Singers, can be sampled in “Crucifixus”, a programme of music for Holy Week on the Guild label. There isn’t quite the same level of extraordinary technical accomplishment here, but Vasari are certainly no slouches, and sing in a potently affecting way. There are works by Palestrina, Lotti and Gesualdo, but I was particularly taken by the one large-scale setting, a 27-minute Stabat Mater by Domenico Scarlatti (he of the 555 harpsichord sonatas fame), which is very fine indeed. Crucifixus – Gramophone - All are sung with feeling and skill. The Italian Way of the Cross is sweet with voices that intertwine like a crown of thorns trimmed with honeysuckle. Antonio Lotti’s eight-part Crucifixus is the famous one, but here are the six- and ten-part settings too. A small masterpiece is Gesualdo’s O vos omnes, a large one Scarlatti’s Stabat Mater. All are sung with feeling and skill. Crucifixus – BBC Music Magazine - Excellent recorded sound capitalises on the acoustics of a fine London church. The Vasari Singers are an amateur choir, and a very fine one. If they need a split second for chords to settle, for voices to focus, the pay-off is a captivating ardour and commitment. Momentary slips, of intonation below a gloriously effortless soprano top C in Allegri’s Miserere mei, of hard-driven soloists in the liveliest sections of Scarlatti’s Stabat Mater – these are a small price to pay for such a fresh, enthusiastic sound. High spots for me are the almost unbearably tortured harmonies of Lotti’s six-part Crucifixus, the dense, enveloping sonority of his eight-part setting, the spaciousness of both distant semi-chorus and of slow paced chant in Allegri’s Miserere mei. Another Crucifixus by Caldara is denser still – in 16 parts from this 26-strong choir – with a hypnotic harmonic sequence surrounding Christ’s entombment. Crucifixus – Cathedral Classical Newsletter - This is an outstanding disc. This is an outstanding disc, not only in terms of repertoire but also in performance. Lotti’s three settings of Crucifixus are particularly welcome.